Any healthy child of ours is going to have big dreams, whether they want to be part of a play on Broadway among the beautiful lights of New York, playing with their band in front of a sold-out crowd, or be recognized as the best quarterback of his generation. Much like we were before we were tempered by the realities of adulthood, there was an endless number of possibilities in what children wanted to do. To many people, however, dreams will remain just that: dreams. Whether it’s because of their eventual financial status, the drive to compete in their fields fading, the lack of talent, or even the simple fact that other responsibilities in life take precedence, the reality of the world we live in can be harsh to the idealistic dreamer. This doesn’t mean, however, that just because a dream might not be an eventual reality, that we should stop encouraging our kids. There’s nothing more heartbreaking for a child than their parent or anyone in their family they look up to telling them that their dream is unattainable, or that they’re not good enough to achieve them. A lot of us have been there when we were kids, and we know how disheartening it felt. Many of us probably had their own dreams when we were kids, and it’s likely that you weren’t able to realize those dreams as an adult. This doesn’t mean that you regret your decisions of course, and the things you experienced in life that forced you to put your dreams in the back shelf weren’t at all bad for you in general. You still ended up raising a beautiful family, and you end up being content with your life. 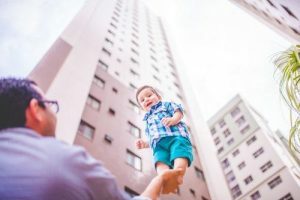 While you may see keeping your kids’ ambitions in check as something good for them, that them being aware of the realities of life at an early stage is actually beneficial, you’ll have to understand something first: your child’s aspirations isn’t about you. As far as your kids are concerned, they can do anything. What you experienced growing up or going through life in general shouldn’t apply to them. They are not you. If they have to fail in their pursuit of happiness, then let them experience and learn from it themselves. If you raised your kids right, then they’ll know how to cope with it. As a person who has already lived through the obstacles of life, we know how hard it is to reach for a goal only for someone or something to get in the way. It felt heartbreaking, it was frustrating, and it was discouraging. What can make it worse is if that opposition came from family. Never get in the way of what your kids want to achieve, no matter how stupid or impossible it sounds to you. Not many people understand, however, that getting in the way doesn’t necessarily mean physically preventing them from achieving that dream. You don’t have to take away the tools that they need to achieve their dreams, you don’t even need to stop their enrollment to that class that they wanted to join. You can get in the way by simply ridiculing them, or even doing something as simple as showing apathy towards their achievements. When it comes to your kids’ dreams, always be mindful of what you say. If you can’t think of anything encouraging to say, then you might as well not say anything at all. Never deny your kids’ dreams, and never preach a negative view on life. Taking action to help with your kid’s dream speaks highly of you as a parent. It’s usually not enough to just take a step back and watch the kids grow at their own pace. Sometimes, your kids will need an extra push to the right direction. As an adult, you should have the resources your children don’t have, and you can use those resources to ensure that they succeed. On top of providing whatever support you can, you’ll also have to consider that children grow at their own individual pace. If you might see that your kid seems to be lagging behind, or that they may not have the talent for their chosen dream, then help in educating them. Teach them the skills if you know them yourself. If you don’t have the talent to help your kids out, then you can still show your support by hiring someone else who does. If your kids want to play the piano, hire someone for piano lessons. If your kids want to play football professionally one day, then find a coach to help him out. Even professional video game players offer their time to teach kids who want to be future professional gamers. You can even hire academic tutors that can help your kids with schoolwork, so they can focus more on pursuing their dreams without sacrificing their studies. If you’re up for it, you can use this website to find tutors near you that can provide the help you need. Your kids will definitely thank you for the knowledge they’ll gain. Our kids will always be looking up to us as they grow. It might be subconscious, but they will always live out what they learn from their parents and the older members of their family. You will always set the standard, and whatever that may be is dictated by how you will act at home and in front of others. Children are more likely to be persistent in pursuing their dreams if they see the same drive from their parents. You want a disciplined child? Then act out the part. You want to raise someone who doesn’t give in to the pressures of life? Then be strong in front of your children. In more ways than one, your actions are the keys to success for your kids. While it’s not always a guarantee that kids become their parents when they grow up, a lot of what you do rubs off unto them, so you better be mindful of your actions. Now we’ve talked a lot about kids, their dreams and how you should encourage them, but what if your kid doesn’t have much of a dream? What if your kid is content with just staying indoors and playing video games without a clear goal in mind? Not being supportive with your child’s dreams is just as bad as letting them go through life without any at all. A good way to go around this problem is by simply asking your kid about it. Find out what his interests are, or what he likes doing that’s productive. You can start out by writing down what your kid likes and what he’s good at, and then researching about it. Find whatever activity fosters that interest and go from there. Is he good at drawing? Then maybe he has potential to be an artist or an architect. Does he like physical activities? Then maybe a career in sports is more his style. Once you have a good idea of his interests, start making a timeline of whatever achievements he can achieve down that path. Make sure they’re realistic, though. You wouldn’t want to disappoint yourself or your kid. From there, make an action plan. How can you help your child reach these achievements? Which schools do you need to send them, or which people do you need to tutor your kid? It takes a bit of effort, but it can help you raise a person who is not without direction in life. It can be a bit tempting to let your guard down when it comes to your kids’ dreams. Imagine, one day you just got home from work tired, and all you want to do is settle down on the sofa with a cold beer. Now imagine your kid running up to you with plenty of energy, enthusiastically trying to show you that thing they’ve been working on, only for you to brush it of saying you’re tired, or you don’t have time for it right now. Now imagine the sad look of dejection on their face. All the effort you’ve put into giving your child emotional support up until then may just as well have gone down the drain. Maintain the same amount of enthusiasm you’ve had for your kids’ dreams from the start. It wouldn’t do for your efforts to start waning in the middle of the journey, when your kids are starting to feel the difficulties in maintaining their hobbies or interests. Right when their interests are starting to decline as they grow older and into their teenage years is when they need your support the most, so keep at it. For the younger kids, creative play is a nice way for them to express themselves and their interests fully. Whether your kids are playing dress-up or opening up a lemonade stand to sell lemonade, this sort of play allows them to explore their interests while they’re at leisure. It also gives you time for yourself if ever you need it. Allowing them time to do creative play is also a great chance for you talk to them, or even share your own dreams, so they can learn from your own experiences. Just remember though, being practical with what you teach is different from being pessimistic. The sad truth is, you won’t always be there for your kids. One day, they’ll need to go about their lives independent from you, including pursuing their dreams. While they’re still young, teach them the basic realities of life. Teach them that they will encounter failure, and that it’s okay. Afterwards, instill in them the attitude that failing isn’t the end of the world, but failing to stand back up can be. An important aspect to success is learning how to manage failure. Teach your kids how to bounce back from it rather than teaching them how to prevent such things from ever happening, because it’s practically impossible to predict every outcome. Do so when they’re still young, so that when they’re older, obstacles wouldn’t feel as hard to them as they actually are. It’s always a better idea to teach your kids how to get to somewhere rather than focusing with the outcome. This allows your child to appreciate the work that they’ve done and wouldn’t get too bogged down with what they have and haven’t achieved yet. Reaching their goals shouldn’t be the priority, though that’s still something to be proud about. This type of mindset can also help them from comparing their progress to others. Try to document your child’s progress over time, as they pursue their individual goals. It’s not just you as the parent who has to deal with the difficulties in life, but also your kids. Remind them how far they’ve gone since they’ve started their journey. Show them a photo of the first milestone they’ve ever reached, or show them a video of their first recital, all the while telling them how much they’ve improved. With the amount of access we have with technology nowadays, keeping these kinds of memories shouldn’t be too difficult. If nothing else, at least you have memories of your child to look at when they’ve grown old enough to have their own. Raising kids to have the confidence and passion to pursue their dreams is an ongoing effort for parents. It’s a difficult thing to do, but you can’t just leave them to do what they want. It’s generally not enough. Kids go through a lot of hardships themselves, and as their parent, it’s your job to prepare them for life. With the right kind of mentoring, and a whole lot of love, you’ll definitely raise a child you can be proud of.